Bought this for my sister for my new nephew's room. She gets compliments on it all the time! It has a nice contemporary look and is not what you typically see in a nursery. She is able to add any accompanying accent pieces she wants without being locked into a "theme." What's greta is this set comes in different colors. Highly recommend for anyone looking for something different for the nursery. 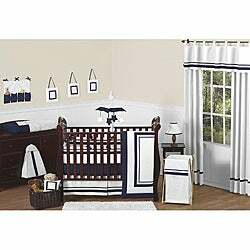 Complete the look of your nursery with this generous Hotel 9-piece crib bedding set. The set includes the soft bedding and decorative elements such as window valances, a toy bag, a decorative throw pillow and much more. I bought this set because in the picture and description it makes it sound like everything that is in the picture is included in the set. When I received the set in the mail and opened the package, I was highly upset. the curtains,the laundry basket, and changing pad cover were not included. The material seems to be very cheap for the blanket. and the crib skirt does not fit properly on the crib and I have tried it multiple ways. The bumper, diaper stacker, and small pillow are the only items I really like out of the set. Although with it all together it does look good aesthetically. I love the bedding I chose for my baby boy's room. I wish I could have found a matching mobile to go with it. Love this set. 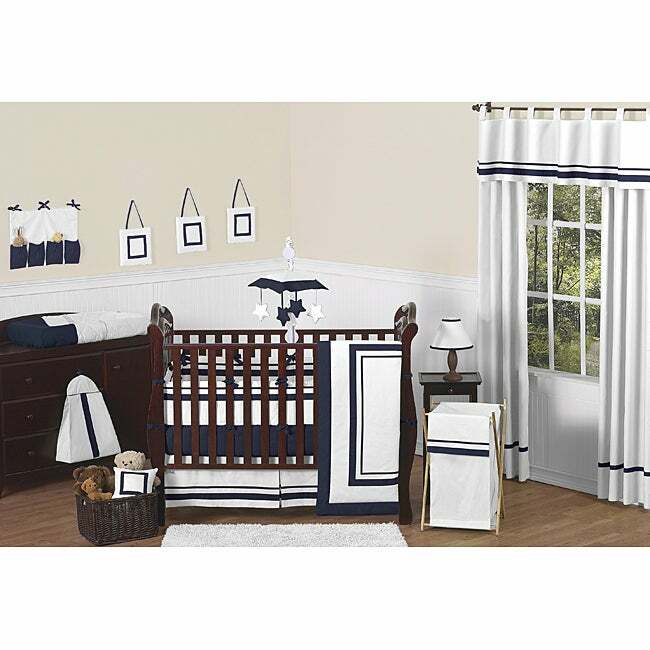 We were nervous it might be too bland, but it looks fantasitc in our nautical theme nursery. Fits and looks great! THIS IS THE CHEAPEST CRIB BEDDING I HAVE EVER SEEN. SAVE YOUR MONEY! IN FACT YOU'LL BE BETTER OFF BUYING AT ******* FOR THE SAME QUALITY. THE MATERIAL IS CHEAP AND I RECIEVED MINE FULL OF WRINKLES AND THE THREADS ARE FRAYING LEFT AND RIGHT. I bought this for my first grandson’s nursery. It’s simple design is easy to match with any theme. For his nursery it was nautical it’s well made and soft and my daughter in law was very happy with it. "how or where can i order the addition accessories that are not included in the set?" unfortunately these accessories are not available.